- The Henry Hudson Parkway becomes the Saw Mill Parkway at the Bronx/Westchester county line, not at exit 24. Signage in the field clearly shows this (Yonkers is in Westchester county), and just about every map I have ever seen concurs. This means the former needs an extension and the latter a truncation. - No waypoint for exit 7 on the Cross County? 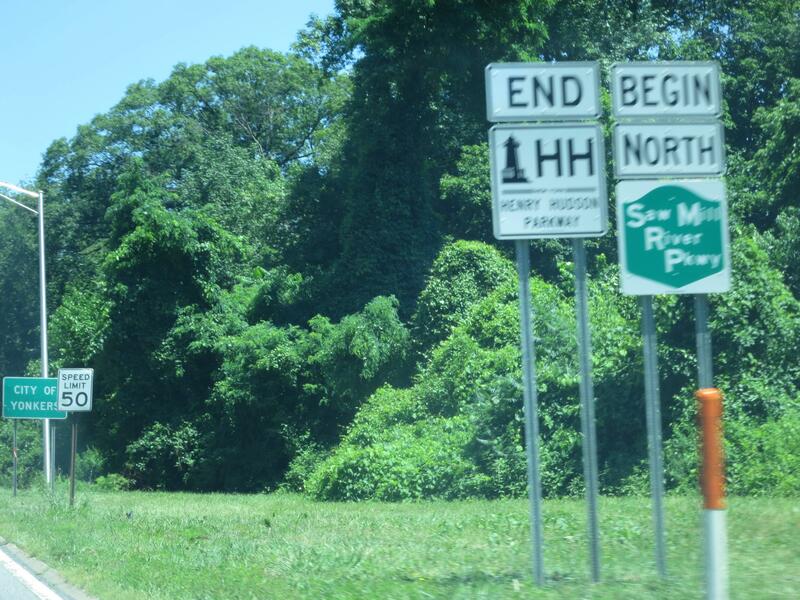 It is awfully close to exit 6, sure, but it is signed separately and has a different destination. Thanks. I will add this to an in-progress NYC-area update. This is a result of the One Point Per Interchange guideline. As for what exactly One Interchange is, that can be wibbly-wobbly at times; it's a judgment call. I decided it was entirely within the footprint of the Exit 6 interchange, being accessed by the same C/D road. Do we want to split them off usanf into their own system (usanyp)? That would make sense to me. We're expanding beyond "freeway" portions now. There are a couple routes like the FDR Drive that probably remain in usasf. I actually have a sheet of paper in my reference route binder listing FDR Drive as part of the parkway system. Of course, no two sources listing NY parkways are exactly the same, which makes things interesting. There's also the question of what to do about parkways that are locally owned and don't have reference route numbers. I actually have a sheet of paper in my reference route binder listing FDR Drive as part of the parkway system. Checked earlier today and the only routes that I recall without the word "parkway" in the name (FDR drive, Robert Moses ParkCauseway) were on Wikipedia's  list of NY parkways. You mean Robert Moses Causeway? As I recall the FDR and Harlem River Drives were included in the list of "parkways" slated to get a new style of shield, although I don't have a link handy. Thus far the Henry Hudson design as depicted in my photo linked above is the only one that has actually started being posted. Might as well move 'em over if we're creating usanyp, I say.